I love quince and planted a 2 year old bare rooted Vranja tree 5 years ago. It has done exceptionally well with absolutely no maintenance. If all the flowers turn to quince, I will have over 200pounds of quince this year. Last year was about 150pounds. Will keep posting pictures here tracking progress. bramble, veggiechicken, Snoop Puss and 6 others like this. I bought one last year - it has little buds but not yet open. Looks great - I'd love one but we're a bit exposed here so not sure how it would do. ^Ours is down in the floor of a very windy valley. Does OK. They're worth it for the blossom alone. Gorgeous. Quinces are a lot tougher than apples, so I reckon you'd find you can grow them no problem. Best to get a named variety, if you are going to use them for cooking. 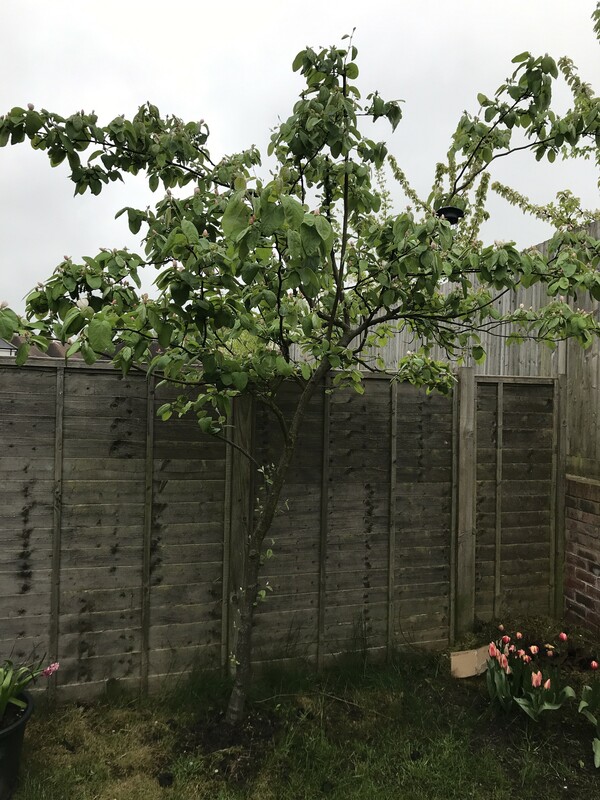 Your Quince tree looks to be in excellent health and growing well. If it was mine, I'd be inclined to clear the grass out completely from round the base of the trunk out to a radius of about 18". Is there anything I can do to prevent diseases to keep it healthy or is it too late to spray it with anything as it is blossoming? Quinces always seem very tough to me. I think they probably benefit form being relatively uncommon so that pest and disease don't have many hosts to build up on to become problems. The best insurance for a healthy tree is to keep it growing well with sensible feeding and watering if necessary, and to give it a bit of bare earth and a mulch over its roots, so it doesn't need to compete with the grass. The other thing which is desirable on most fruit is to keep the center open by pruning out branches, so that more air and light can get in to what's left. I've not grown standard quinces myself, so I hesitate to give too much advice, but if your tree was an apple, I'd say prune out one branch near the middle. Last edited by nickdub; 29-04-2018 at 01:02 PM.